Have you always wanted to get your company's headshots updated and current but struggle to find a good time to schedule the entire staff to travel to an off-site studio? Doesn't matter if it's 3 people in the office or 400, I can travel to your office location and set up a portable studio (see below). All I need is a conference room or a 10' x 15' area to set up the studio backdrop and lighting. While the setup looks a little small, the results speak for themselves. See below to view the edited version. Thanks to a long lens that provides great compression, the backdrop fits the entire frame. There is quite a bit that goes into owning, transporting, setting up and breaking down the portable studio. Due to the nature of that, I charge a $60 setup fee to bring the studio to you/your office. After that, it costs $125/hr for the headshots. 2 hour minimum. Per hour price includes the online delivery and storage for 10 years as well as the time spent editing and retouching outside of the shooting time. Generally I can get 6-10 people in per hour, however I prefer to favor the 5-6 per hour in order to get the best shots of each person. You have the right and freedom to wear whatever you want for your headshots. The info below strictly opinion based. At the very least, it can help you ask yourself the proper questions in order to make apparel decisions. Solid colors work best. If your favorite shirt that gives you an added layer of confidence happens to be a pattern, stick to bigger and/or non-busy patterns. Any tight pattern will be very distracting and take the attention off of your face. Secondly, consider what you want your end-user (client, recruiter, hiring manager, etc.) to see and feel when they look at your headshot. If you're an actor who specializes in rom-cons, then a bright color shirt can give your headshot a boost of energy. If your a lawyer who wants your headshot to give a "no monkey business" type feel, then stick to traditional white, light blue or gray solid colors. Again, think of your end user. If you're a social media manger for an "edgy" company/client, then big earings and facial piercings may be the feel that you're going for. If you're applying for jobs in the coorperate world, even in the tech strartup realm, I'd suggest to keep it simple. No facial jewlrey (small studs if you can't take them out) and keep the earlings and necklaces on the smaller and elegant side. They should be an accessory, not an attention grabber. Jacket/Sport Coat: For either Men or Women, think about the job or clients that will see your photo. If you feel your customers or hiring manager would feel more comfortable with someone who acts with 100% professionalism (straight to business, no small talk) then a suit or sport coat may be the best bet. Since headshots are generally elbows or shoulders and higher, no need to wear the full suit. Just bring the jacket to the session and put it on right before we shoot. Don't wear it while driving, it will wrinkle! If you want to appear more friendly and approachable, then I'd skid the jacket. A nice and professional top (longsleeve button down for men) looks great in headshots and gives the end-user the feeling that you're easy to talk to. Tattoos: There's a theme to all of these categories and tattoos are no different. Just ask yourself, "would my future client or manager care if I had visable tattoos?" If your tattoos are unable to be covered (mainly neck and facial tattoos), I can photoshop them out. However, keep in mind that this can be percieved as misleading to your client or hiring manager when they end up meeting you in person and see said tattoo. Sometimes people are in the process of having them removed and it would be gone by the time they met anyone. It's a $25 additional charge for this service as it is a difficult process to remove them and make it look natural. Up-Plugged - Many couples know that technology plays a huge role in their BIG day, but as cell phone cameras (and the like) keep getting resolution upgrades the guests will begin to become cell phone photography experts. This becomes an issue for not only your very expensive wedding photographer, but for the happy couple as well. When you begin to receive your pictures post-wedding, you may start to notice an increase of glowing devices, arms and bodies blocking some of the great ceremony environment that you worked so hard on. While "photo-shopping" is an option, most wedding photographers charge extra for that service as it is incredibly time-consuming if you want any kind of quality results. So, my advice is to have an "Un-plugged" ceremony where your guests are forced to sit back, be present and experience your beautiful wedding without viewing the entire thing on a 3.5" screen. Being present and in the moment.... sounds terrible, right? Why didn't the photographer dress up? Will My Guests be Upset? As many of your guests would text, email and call you with their concerns about missing out on the instant social media uploading capabilities if they're not informed prior to the ceremony, addressing the expectations and having a plan that will solve a few concerns ahead of time will go a long way. Including it on the Invitations and/or a separate info/guest-request card are great ways to handle the situation. 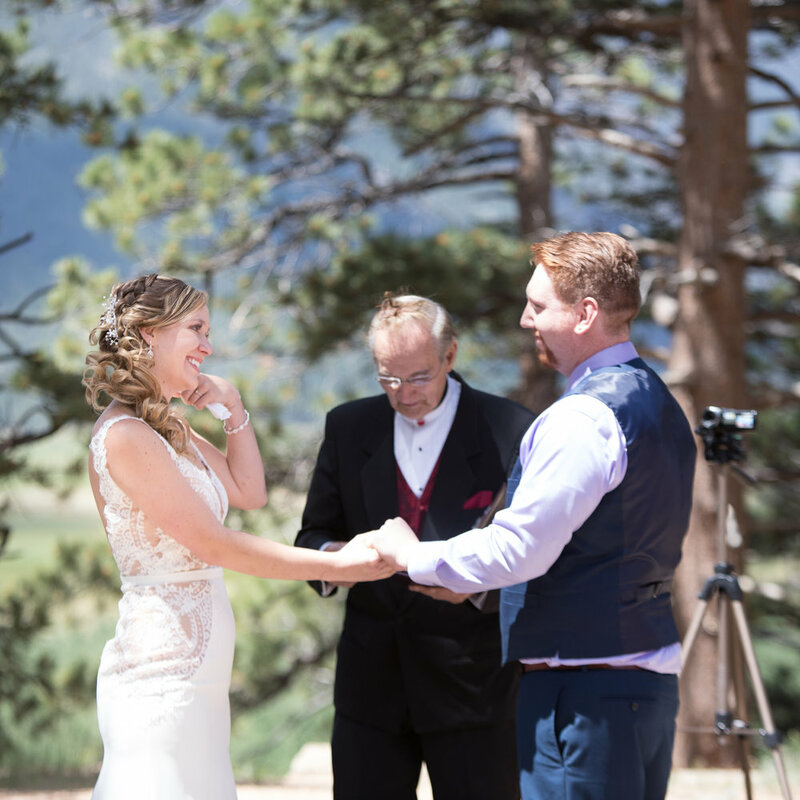 You can also add it to your wedding site for your tech-savvy guests. Please don't forget to include a paper/mailed version as well though. Memaw (aka- your Grandma) may not frequent the interwebs as much as you'd like. Plus, the more goal/expectation setting you can do prior to the big day, the better. I've also seen little cards that the ushers hand out to guests as they arrive. Your guests generally have the best intentions when they unknowingly ruin a photo like this group did. The guests were not trying to keep the Groom from seeing his Bride-to-be as she appeared for the first time in her beautiful wedding dress. No, they were also excited to see her and mainly wanted to capture the moment so that they could relive the experience themselves as well as share it with friends and family who couldn't make the wedding. These are all good reasons, so how can you keep your guests happy too? The answer: Make the professional photos you paid for easily accessible and shared with them as soon as possible. I've even agreed to share 3 main pictures from the ceremony before the reception started. However, I don't recommend that you write this into your contract with your photographer or even make the request unless you are ok with an additional 30 minutes added to the break between the ceremony and reception. 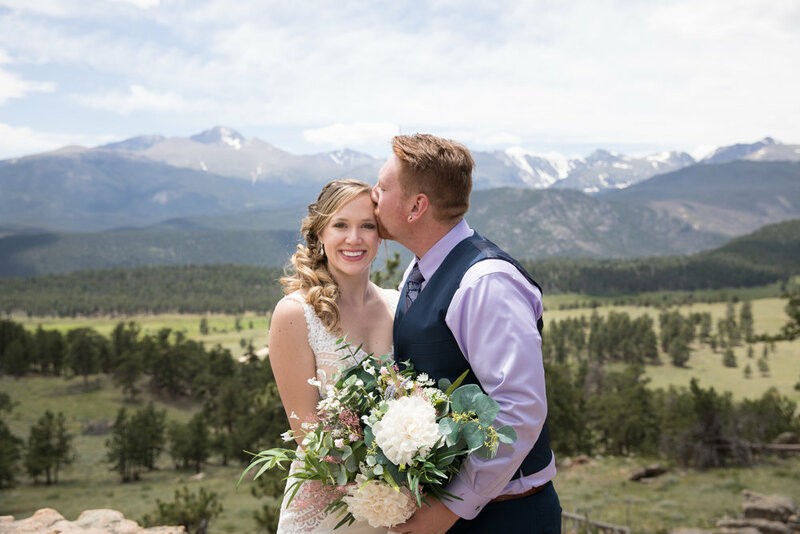 What I would recommend is that you work something out with your photographer that gets you a half-dozen pictures sent to you or posted on your FB wall by a certain time and date. Maybe even right after the reception ends. Don't expect this to be a free service, but it would be well worth it if you can keep people from ruining your pictures. Be creative, not rude. Let your creativity run wild and find fun and beautiful ways to include the message in your mailings as well as on site. Contact your photographer as well, they may have some other ideas not mentioned here. I have my own-bag-o' tricks that I keep for myself and my clients. No guests in the aisle please! Keeping technology out of your guests' hands during the ceremony is in the happy couple's BEST interest. There are no re-dos on a first kiss or the beautiful Bride walking down the aisle for the first time. If "Uncle Bob" decides to jump out into the aisle during the first kiss in order to capture the special moment on his flip phone, you (as a client/couple) may be pretty upset that there isn't a high-res professional shot of this magical moment. It's what you paid a lot of money for, so be sure to get the most out of your time, effort and money. Side note: Photographers strongly dislike people ruining their pictures too. They just want to make their clients as happy as possible and ruined photos make that pretty tough on everyone involved. Click here for more ideas of how to communicate the "unplugged" message to your guests. Has anyone seen the Groom? Shows that you care! Most recruiters and hiring managers don't actually care about your actual headshot. What I mean by that, is that they don't care what you're wearing, what you look like, how it's taken, etc. What they do care about is the fact that you take your professional career serious enough to pay, coordinate and take the time to have a headshot taken. Why are headshots generally so expensive? The difficult part about explaining this is being able to effectively communicate the behind the scenes process that is takes to produce your headshot. Besides buying/owning the gear and posing practice/research, I have to load up all of my lights, light stands, camera, memory cards, reflector, and charge the batteries for everything. Then drive to the location and unload all of the gear, set up the light stands and lights. After the picture(s) is captures, then I pack it all back up, dive it home, unload it back into the house and begin transferring the files to my computer. The editing process is what generally takes up most of the time and how photographers justify charging what we do. The software is a minimum of $20/month and then we remove acne, scars, blemishes, stray hairs using Adobe Lightroom and Photoshop. Adjusting the color, contrast and highlights/shadows comes next. And finally I run a few processes over your image to smooth out your skin in a natural way so you don't look like a mannequin. This process involves a technique called "Frequency Separation" followed by a high pass filter for non-skin areas. Can I bypass all the fancy editing parts to save money? Unfortunately, no. I take pride in my work and always want to deliver the highest quality product that I'm able to. If I skipped those steps, I wouldn't be able to sleep at night. It's just a part of who I am.